Gina Biggerstaff and myself (Bernie Donaghy) delivered the Incredible Years® Basic Parent Programme in St Kieran’s Primary School in Colin, Northern Ireland, from March to June 2014. The Incredible Years® places strong emphasis on building positive relationships with children, and play time serves an important role in this. After discussing the importance of play time with children in our parenting class, we wanted to provide parents with something tangible to bring home for this special time spent with their children. 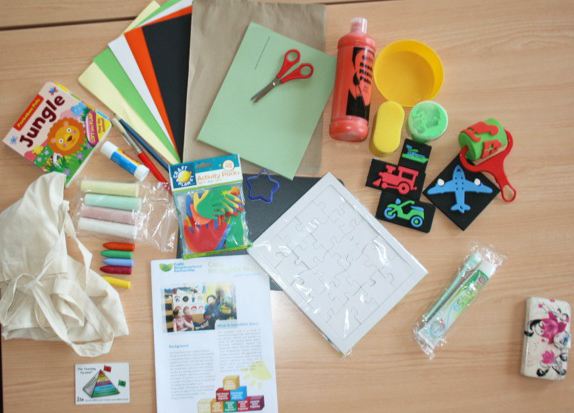 We decided to give parents the opportunity to work with a range of art activities and resources, to enable them to fully engage with their children during their play time. Gina and I used every opportunity to pick up different art resources as we were out and about (beg and borrow). We collected chalk, paper, paint, and more. We asked local Nursery Schools, Primary Schools, Play Groups and Community Organisations for any unwanted or unused art materials or books. This also gave us the opportunity to publicise and spread the word about our Incredible Years® classes! The bags were used as an incentive each week and on completion of the IY Parent Programme we added a toothbrush and toothpaste, a book and a blank jig-saw. 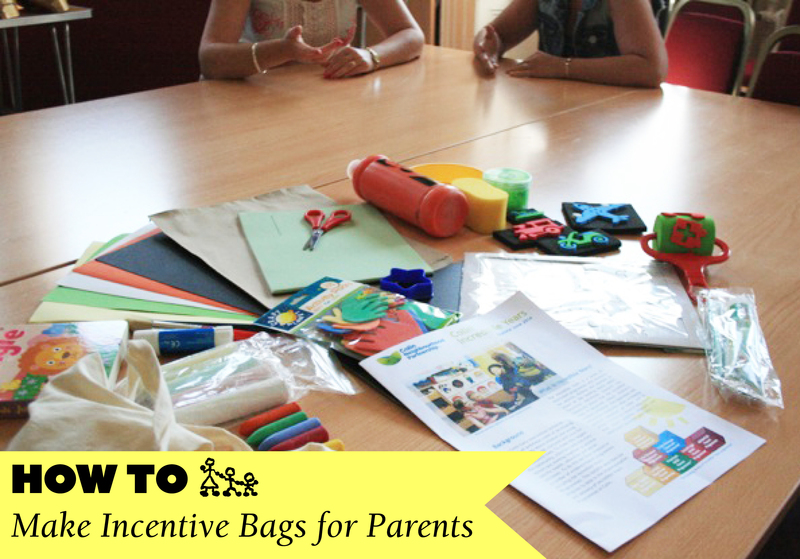 The parents loved their resource art bag and they reported that their children really enjoyed their play time together. To learn more about The Incredible Years® implementation in Northern Ireland, see the recent blog post about this! Categories: Guest Blogging, Incredible Years | Tags: Children, Incentives, Incredible Years, Northern Ireland, Parenting Classes, Parents, Prize bags, Rewards, Teachers | Permalink. 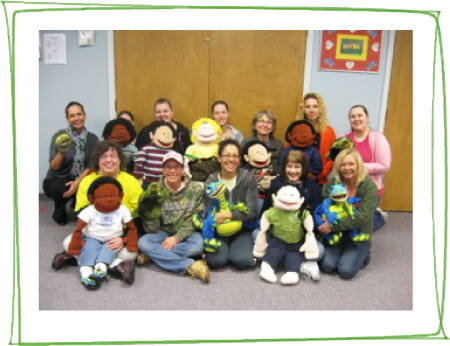 At Gateway-Longview Therapeutic Preschool in Bowmansville, New York, our teachers use the Dinosaur School Curriculum as part of the school’s Safety Theme. The objective is for students to understand that teachers will keep them safe at school. When the lesson is presented Dina Dinosaur talks about being calm and safe. She models calm, safe behavior with deep breaths and a Raggedy Ann body (curriculum cue cards for Wally taking deep breaths and showing a relaxed body are shown). Children practice these calm down skills with Dina. Next Dina calmly explains that when children get of control and are not safe, the teacher and Dina will keep them safe. They model what will be happen if this occurs and start by reassuring the children that Wally is only pretending to be out of control/unsafe. Wally demonstrates how to go to the calm down chair to take deep breaths and cool down into blue on the calm down thermometer. After Wally does this the teacher and Dina ask Wally how he is feeling. Wally talks about how his breathing exercise is helping him. 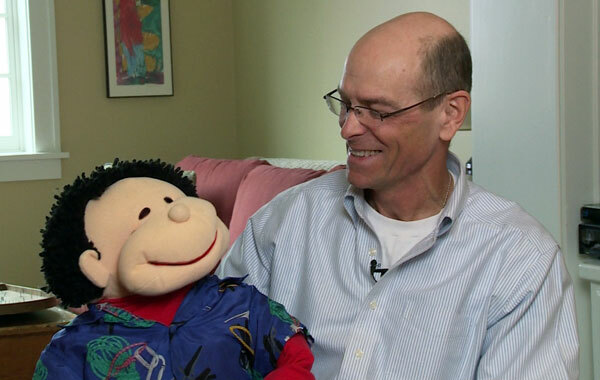 The children are also given turns to ask Wally how he feels and tell him how they try to stay calm. During the practice part of the lesson the teachers take photos of the children practicing safety as they work and play in the classroom. Later the children make a collage of their photos entitled “SAFE PLAY.” Throughout the day children are reinforced for episodes when they practice safe behavior. 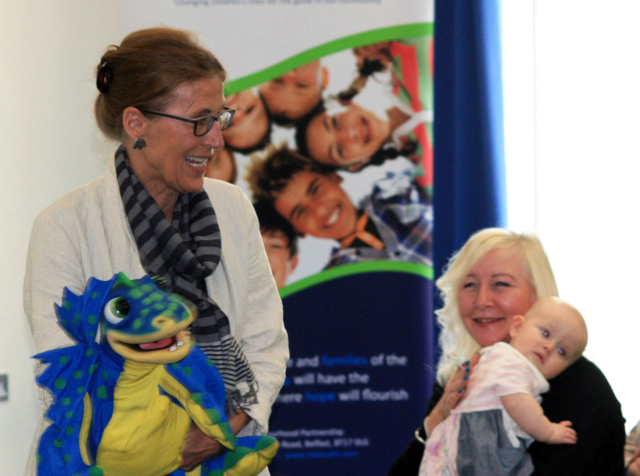 Parents are encouraged to attend these dinosaur lessons and to use a similar approach at home. Categories: Guest Blogging, Incredible Years | Tags: Classroom Dinosaur, Gateway-Longview, Incredible Years | Permalink. Guest Post – New Meta-Analysis looks at Effectiveness of Incredible Years®! This marks our FIRST Guest Post, courtesy of Incredible Years® Developer, Carolyn Webster-Stratton! Dr. Webster-Stratton has taken the time to write a summary of a new meta-analysis that has just been published, examining the effectiveness of the Incredible Years® Parent program. The full paper can be purchased online, here. 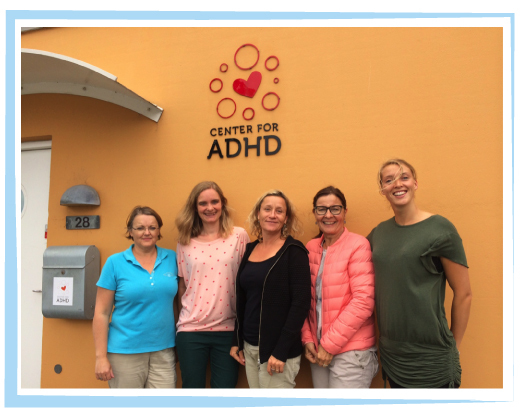 A new meta-analysis paper has just been published by a Dutch team. 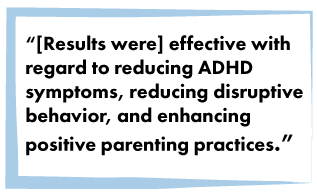 This review examines the effectiveness of the Incredible Years® parent training to reduce disruptive behavior and promote social competence in children. Fifty studies were conducted where the Incredible Years® parent program was compared with a comparison control group by various researchers. Findings indicate that the Incredible Years® program is successful in improving child behavior, particularly for the most severe cases, and with a diverse range of families in different contexts. The parent program is considered by this review to be well-established. These positive findings which are comparable across a range of studies may be interesting for policymakers, agencies and practitioners. Take a look at this meta-analysis which separates prevention from treatment studies and assesses intervention, child and family characteristics, and effect sizes for different outcomes. 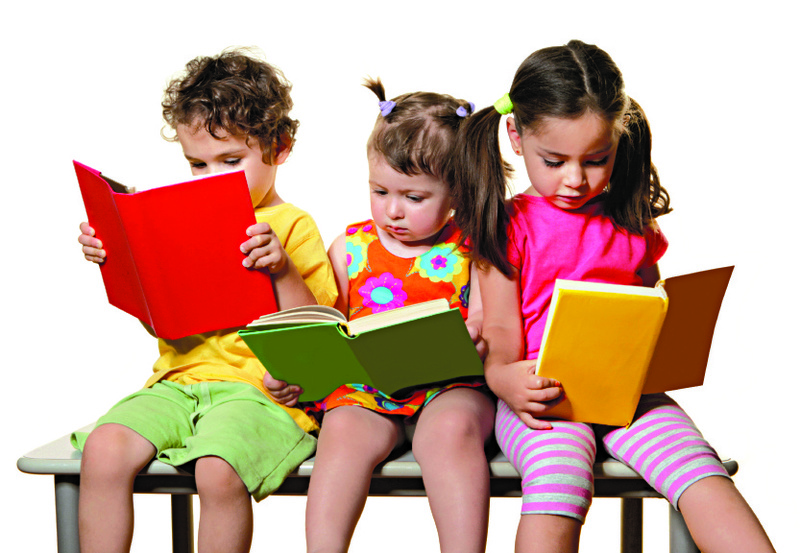 Number of sessions attended by parents was positively related to intervention effects. We are very excited about this review! We hope you will share this with others who may be interested in the research and/or the Incredible Years®. Categories: Guest Blogging, Research | Tags: Evidence based, new research, Parent Program, The Incredible Years | Permalink.